Belur is world famous for the Chennakeshava temple built during Hoysala period. The town is located in Hassan district of Karnataka, India. Belur is also known as Velapura is located on the banks of River Yagachi in Hassan district. The Belur town was the capital of Hoysala dynasty during early 11th century. Belur along with Halebidu makes an important tourists place in Karnataka. The place is known for number of beautiful temples, monuments built during Hoysala period. Belur is also known Dakshina Varanasi. The world famous and mesmerising architecture of Hoysala dynasty can be witnessed in Chennakeshava temple in Belur and Hoysaleshwara temple and Jain temple in Halebidu. It can be said that Belur is truly heaven on earth for the architectural temples it holds. There are many tourists’ places to visit in and around Belur. Summers are from March to May. It would be very hot and if you are planning to visit during summers then it would be good to carry light cotton clothes. Monsoon is from June to September with heavy rainfall. Winter months are from November to February. The climatic conditions would be very good and light woollen clothes are sufficient. The city celebrates Hoysala Mahotsav in the month of March. The ideal time or the best time to visit Belur would be from December to March. Belur is around 40Kms northwest of Hassan. The place is at a distance of 221kms from Bangalore which is around 4hours drive. Other important places which are close to Belur are Chikamanglur which is 22kms, Halebidu is 16kms, Mysore is 149kms and Mangalore is 166kms. The nearest airport would be Bangalore and Mangalore. From there one can drive down to place. There are also frequent buses from the major cities of Karnataka and other South Indian places. The nearest railway station is Hassan. Getting to Belur should not be a problem at all. Ones visiting Belur one should also not miss to see Halebidu and other important places near Belur. The magnificent Chennakeshava temple was built in 12th century by the Hoysala ruler VishnuVardhana on the banks of Yagachi River. The temple is also known as Keshava temple, Vijayanarayana temple. Even though the temple was commissioned by Vishnuvardhana it took 103years and three generations to complete it. The temple is around 16kms from Halebidu temples and it is one of the important Vaishanava pilgrimage place for Hindus. Chennakeshava temple is an evidence to the architecture and culture of Hoysala rule during 12th century in South India. 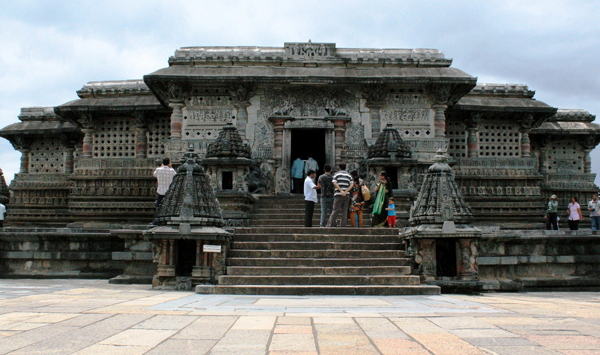 Chennakeshava temple is one of the masterpieces of Hoysala. Hoysala king Vishnuvardhana commissioned it in 1117AD but the masterpiece was completed only after 103 years. According to the history it is believed that Vishnuvardhana commissioned this temple for his military success. But according to mythology Vishnuvardhana built this temple after his conversion to Vaishnavism. King Vishnuvardhan was originally a follower of Jainism came under the influence of Ramanujacharya and converted himself to Vaishnavism. The Chennakeshava temple is dedicated to Lord Vishnu. The temple was built from the best architects and artists. The Hoysala rulers were originally from Malenadu district of Karnataka. They ruled Hassan and of other parts of Karnataka from 10th to 14th century. After shifting their capital to Halebidu, Vishnuvardhana built Hoysaleshwara temple which is dedicated to lord Shiva. 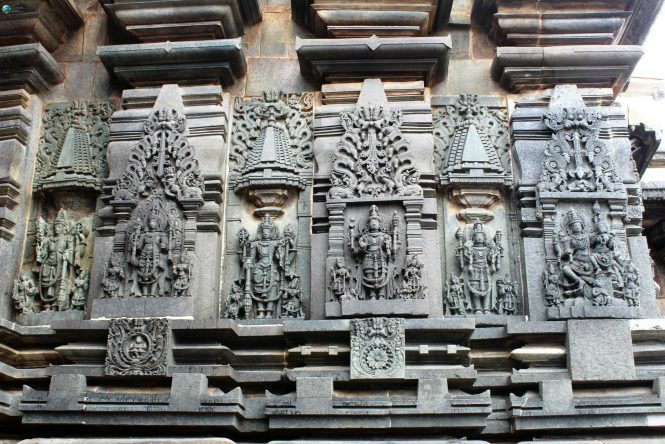 Most of the temples built by the Hoysala rulers have broad themes about Hinduism which is visible in the sculptures. The important part of the Hoysala temple is the garbha griha. Most of the temples built by Hoysala have entrance supported by pillars and are on a raised platform called as jagati (a raised surface or platform) along with pradakshina patha. However by 14th century the Hoysala Empire was defeated and plundered by Malik Kafur who was a commander of Delhi Sultanate. Belur and Halebidu was ransacked and ruined by Delhi Sultanate, later the territory came under the control of Vijayanagara Empire. The architecture of the temple is truly stunning and beautiful. The temple has three entrance where the doors are decorated with dvarapalakas( door keepers or guards ). The central hall or the navaranga in Belur is the biggest of all the Hoysala temples. At the entrance of the temple a huge Rayagopura welcomes the visitors which are like the crown of the temple. The Rayagopura was built during the Vijayanagara period. The temple is built using the soapstone. Soapstone easily allows the artists to do carvings and it hardens over a period of time. The temple is at a height of 37metres with outer walls is beautified with dancing girls posing in different postures. The original temple that was built by the Hoysala had no boundary wall; it was built later on in 13th century for the security reasons. Even the main mandapa was also covered with perforated stone screens. Inside the wall of the Chennakeshava temple there are many Hindu temples with small shrines. The temple is facing towards east and it is built in ekakuta vimana style which is a combination North Indian Nagara style and South Indian Karnataka style of architecture. To the south of the temple is Kappe Channigaraya temple and to the right and left side of the temple is small shrine of Lakshmi and Andal temple. Andal temple is also known as Ranganayaki temple is beautifully decorated with artistic works of elephants and other animals and nature. The temple has 31 images of deities from Vaishnavism, Shaivism, Shaktism. Kappe Channigaraya has two shrines of God Venugopal and Chennigaraya another name for Lord Vishnu. Kappe chennigaraya was built by the queen is a smaller version of Chennakeshava temple. However the architecture of both the temples are excellent and quiet similar. Vijayanagara Empire further improved the temple by building many small shrines around Chennakeshava temple. To the west of the Chennakeshava temple is a small temple of Viranarayana. It has garbha griha and also has 59 large images of deities on the outer walls. Near the Viranaryana temple there is a mandapa or dias known as vahana mandapa. There are two main pillars or sthambha in the Chennakeshava temple complex which was erected by Vijayanagara Empire and the Hoysala Empire. The one which is facing the main temple, the Garuda was erected by Vijayanagara Empire while the other pillar which is on the right of the complex, the deepa stambha or pillar was erected by Hoysala empire. The pillars are the beauty of the Chennakeshava temple. There are 48 beautifully carved pillars inside the temple. The central four pillars are built and carved during the Vijayanagara period. Among all the pillars the Narasimha pillar is the most beautiful and has miniatures figures carved from top to bottom of the pillar. It is believed that the pillar used to rotate earlier but not anymore. Another important pillar is the mohini pillar which has carvings of Brahma, Vishnu and Shiva and the ten avatars of lord Vishnu. The pillars and the walls are beautifully carved with different poses of women, Gods and more scenes from Ramayana and Mahabharata. One can see the garbha griha after passing the pillars and the mandapa. Jaya and Vijaya dvarapalakas welcome the tourists at the entrance of the door. The outer walls of the temple are beautifully decorated with different strips of carvings. The art work on the outer wall is the best part of the temple. The bottom strip of carving has elephants with different moods. The next strip is the row of horsemen in different riding positions. The other strips of carvings include female figurines in different dance posture, scenes from Ramayana and Mahabharata, ten avatars of Mahabharata. 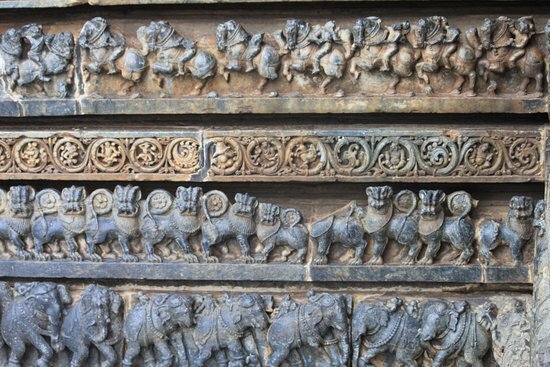 Later on some more strips of carvings were added like Hoysala court scenes, Lord Hanuman and Garuda fighting on Shiva linga, Krishna killing Kamsa and many more. On the dome of the pillars one can witness the madanakai figures (sculptures of women in different style pose ). Some of the artists have done signature on their work which gives information about their family and the history. Some of the famous and important artists are Dasoja and his son Chavana, Chikkahamppa and Malloja, Ruvari Mallitamma and many more. 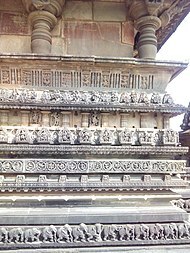 Even though after Hoysala Empire the Vijayanagara Empire did built many small shrines are repaired many structures but the temple was destroyed and damaged by the Muslim rulers. A visit to vibrant state of Karnataka would be incomplete without visiting Belur and Halebidu. The Hoysala dynasty has left immense art and architecture in the state which has now become an important tourists destination.